Collingswood’s Hearthside (Best New Restaurant) and Zeppoli (Best Restaurant) were recognized as was Shigeru Fukuyoshi (Outstanding Chef) from neighboring Sagami and Valentina Fortuna (Rising Star Chef) from Constellation Collective. The Farm and Fisherman Tavern in Cherry Hill received two nods with Jess Gaspero in the running for Outstanding Pastry Chef/Baker and Danny Childs being nominated for Outstanding Spirits Professional. Other locals in the running included James Yoakum (Outstanding Spirits Professional) of Cooper River Distillers and Sean Comminos, Bill and Penni Heritage (Outstanding Wine Profes- sional) of Heritage Vineyards in Mullica Hill. Bertucci’s, the chain with locations in Marlton, Mount Laurel and Sicklerville, has filed for bankruptcy and sold its assets. The fate of the area locations is unknown at this time. James Malaby, chef and owner of Blueplate in Mullica Hill, has recently opened his second restaurant, Center Square Tavern in Woolwich. The menu features a mix of pub grub and larger entrées that are in line with Malaby’s focus on farm-to-fork cuisine. There’s also a full bar with 16 beer taps. OpenTable, the online restaurant reservation company, named the Franklinville Inn as one of the 100 most romantic restaurants in the entire country. In all, six New Jersey eateries made the list, including Cape May’s Peter Shields Inn and Washington Inn. Artisan doughnuts seem to be all the rage with several new spots opening their doors recently to serve up hand-dipped doughnuts made to order. 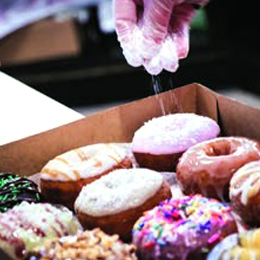 Washington Township has welcomed Mama Buntz’s Donut Company while Marlton has seen the chain Duck Donuts set up shop and the Haddonfield Donut Company has also made its debut. After 17 years in Haddonfield, The Little Tuna has left town for new digs in Lindenwold. When the P.J.W. Restaurant Group purchased The Irish Mile in Westmont last summer, many wondered what the future of the once beloved craft beer bar would hold, especially with the restaurant group having a P.J. Whelihan’s, Treno Pizza Bar and The Pour House nearby. Turns out it will be a Mexican spot called Central Tequila and Tacos and is expected to open sometime this summer. 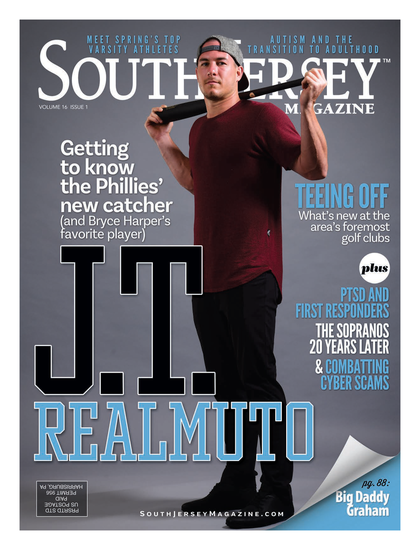 Each new Phillies season brings new excitement, and it’s not always about the play on the field. As usual, there are several new concessions available at Citizens Bank Park this year. Along the left field plaza you’ll find new hot dog, burger and dessert locations, as well as the relocated Bull’s BBQ. Jane Dough Cookie Dough can be found behind sections 110 and 142 and offers edible cookie dough with your choice of soft serve and toppings. Other new items include smoked brisket tacos and a Turkey Hill sundae bar. Over at the Harry the K’s restaurant, new menu items include a crispy chicken sandwich with tomato bacon jam and shaved brussels sprouts, a vegan cauli- flower cheesesteak and vegetarian tater tots with curry lime ketchup.